This article is 2602 days old. A new local grassroots community organization have spurted up with the aim to support locally owned businesses. 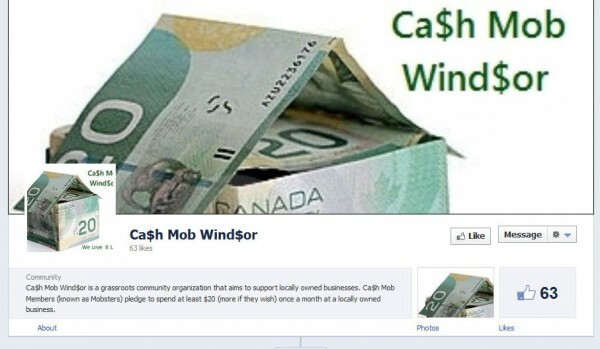 Ca$h Mob Wind$or has a very simple objective, to highlight and promote community support for local businesses that are struggling in a tough economy or whose owners are actively involved in serving the community. The first Cash Mob was in Baltimore in August 201, ans has since been spreading across North America ever since. Ca$h Mob members, who are known as Mobsters will pledge to spend at least $20 or more once a month at a locally owned business. Each Month the group will announce the date and time of the monthly Ca$h Mob one week before the event. Mobsters are able to nominate any local business any time during the month by either posting on the groups Facebook wall or by sending sending them a message. One of the nominated businesses will then be chosen each month to be mobbed, but the location will be kept secret until the day of the event. On the day before the event the group will announce a location to meet and once all the Mobsters have gathered, they then will reveal the name of the business chosen to be mobbed, and will then proceed to mob it. Mobsters who can’t attend the scheduled event are encouraged to patronize the chosen business at any time in the following week, simply just tell the owner why you’re there. 2) The business must be locally owned. 3) The business owner must give back to the community in some way. 7) The business owner must approve the Ca$h Mob before the mob is announced. 8) Ca$h Mob members must join us for celebratory drinks after the successful mob. 9) The cash mob will occur during the evening on a weekday or on a weekend. 10) Pictures will be posted to Facebook after the Ca$h Mob. The first Cash Mob will be on March 24th, which is also National Cash Mob Day. Watch the Facebook page for more information.